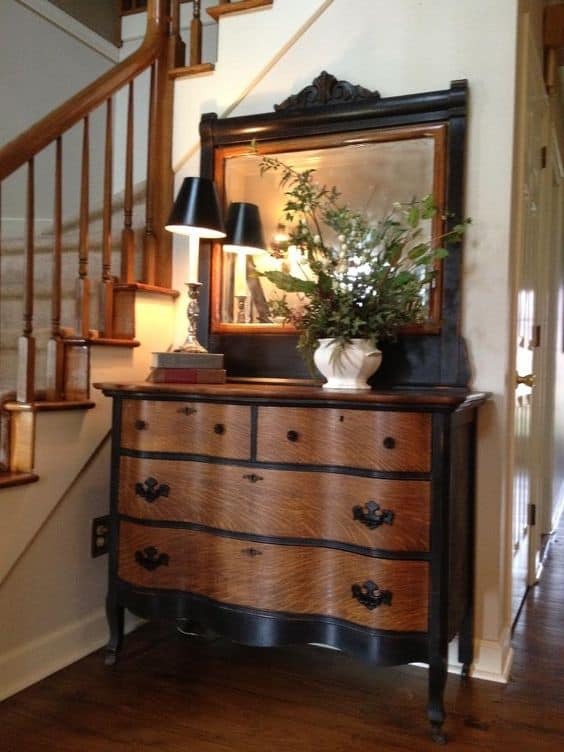 One day, Mom Baker’s eagle eye spotted an antique oak dresser on the curb in one of the developments she services and I quickly got a text not too long afterwards (when it was safe for her to text, of course). I saw a dresser on the side of the road during one of my runs. It looks like something you would like. A free antique dresser on the side of the road just down the street from where I live? Um, YES PLEASE! The Marshmallow and I made it to the address (in record time) and lo and behold, there was a gorgeous oak dresser sitting on the curb. I couldn’t understand why someone would be throwing it away! I immediately jumped out and lowered Marshmallow’s tailgate. 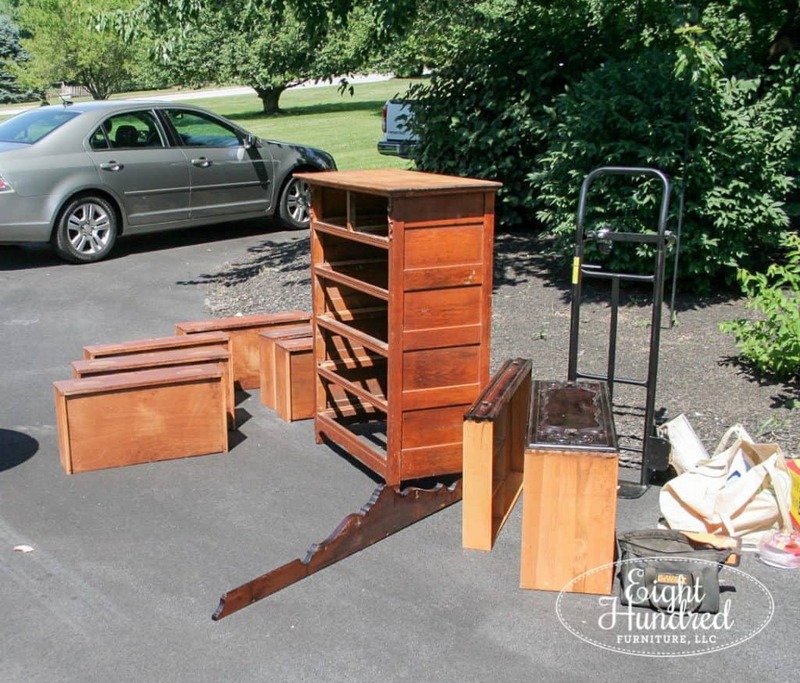 As I came around to survey my trash-picked treasure, it became obvious why the owner was pitching the dresser. Literally every drawer was falling apart. If the dovetails weren’t separating, then the bottom was falling off. One drawer was laying on the ground, completely in pieces. My shoulders dropped a bit and I got a little bummed out. The dresser was definitely going to take a lot of work if I decided to take it. 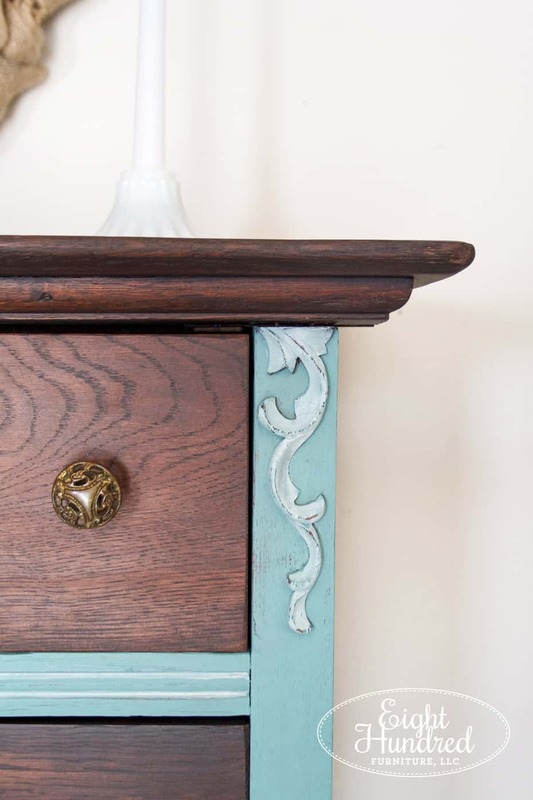 As I ran my hands over the piece, shimmied it from side-to-side, and peered inside, the dresser had a lot of good things going for it. It was 100% solid (and heavy) oak. The top would refinish beautifully. All of the hardware was attached (and boy was it pretty) and it had the prettiest flourishes in each of the top corners. The good things outweighed the mangled drawers, so I decided to keep it. As I started rocking it back and forth towards the tailgate, I realized just how heavy the dresser was with all (but one) of the drawers in! Somehow, I was able to get it up into The Marshmallow, strapped in, and into the dining room of my parents’ house. The wood on the dresser was absolutely beautiful. 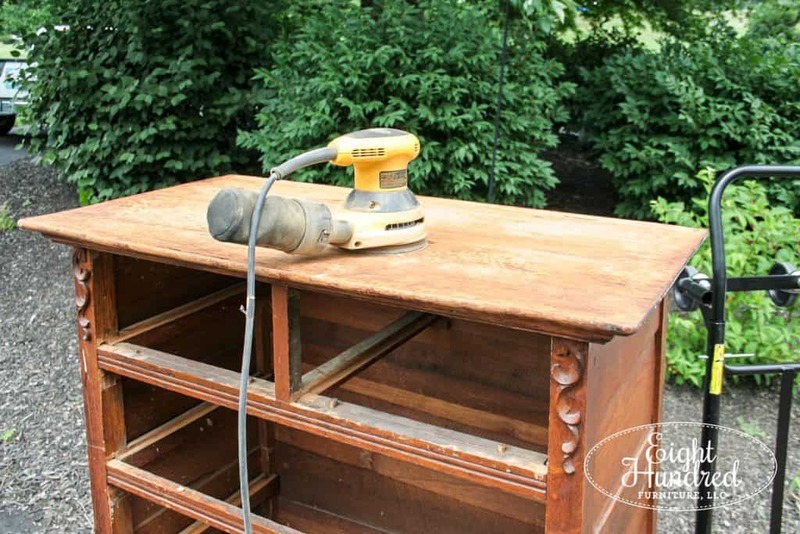 It was hiding underneath an old and worn finish, so when the time came, I started its makeover by sanding down the top and the fronts of all of the broken drawers. 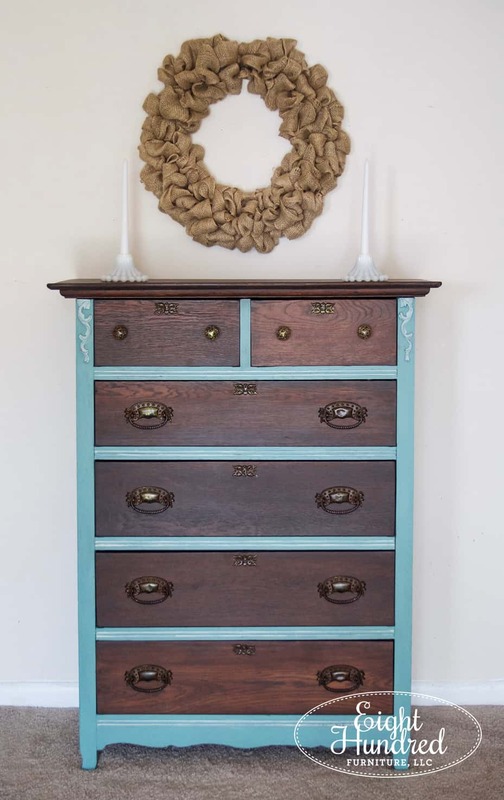 I actually had a marathon sanding day that included this dresser, my Jacobean buffet, and an industrial spool. I figured if I was sanding one piece, why not do two more? It was actually pretty comical to stand back and admire how I had essentially taken over the driveway with my furniture. 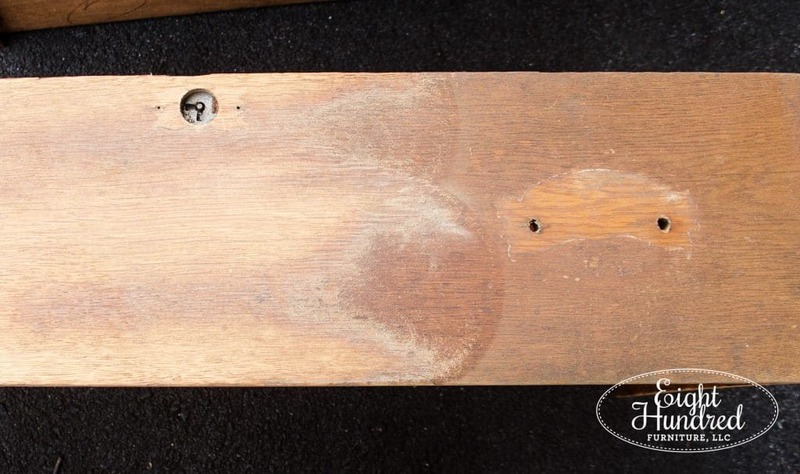 I took all of the hardware off and you could really see how the finish had aged over time. I carefully started with the drawer fronts. 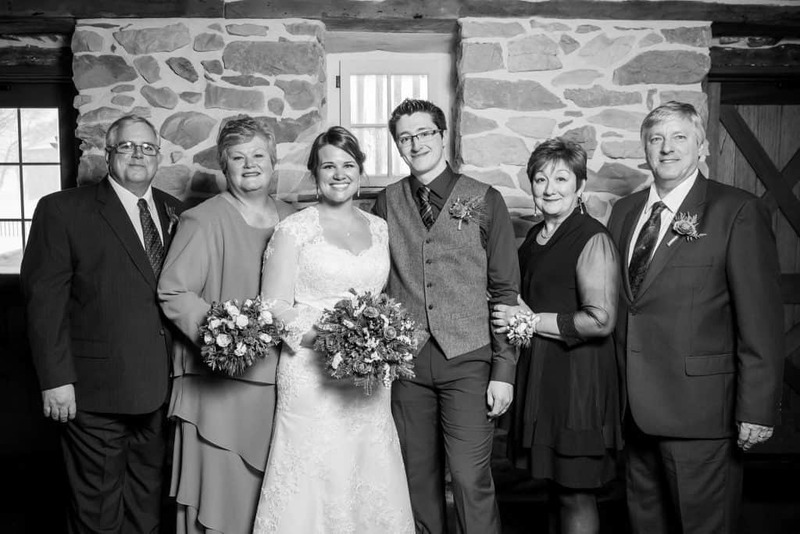 While they look like they’re holding together well in these photos, they would have fallen apart if you picked them up. After a few swipes with my orbital sander, I got super excited. The wood was sanding down really well and it was still so beautiful after so much time had passed. They were simply screaming to be stained with General Finishes Java Gel Stain (which I did a little later). The top sanded down just as well and I hit the body too for a quick scuff. 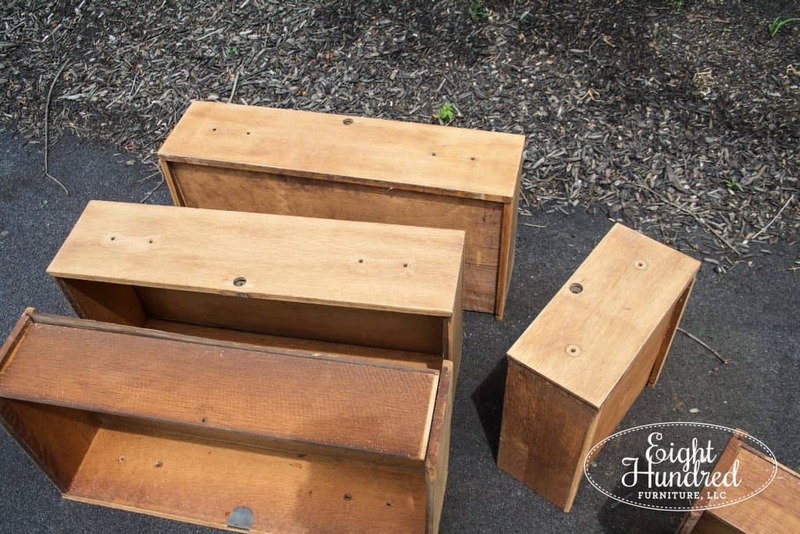 Once everything was sanded and scuffed, I set about reconstructing the drawers. Using a combination of wood glue and my nail gun, I got them all back in working order. It took a good solid 2 hours to take them apart, pluck out all of the old nails, hammer them back into place, and reconnect all of the pieces. One of the top drawers is missing a runner, so it comes out a little crooked. I didn’t have any wood pieces that could be used to rebuild it, so I decided to let it be. After all, the drawer is still usable, but it pulls out a little wonky. 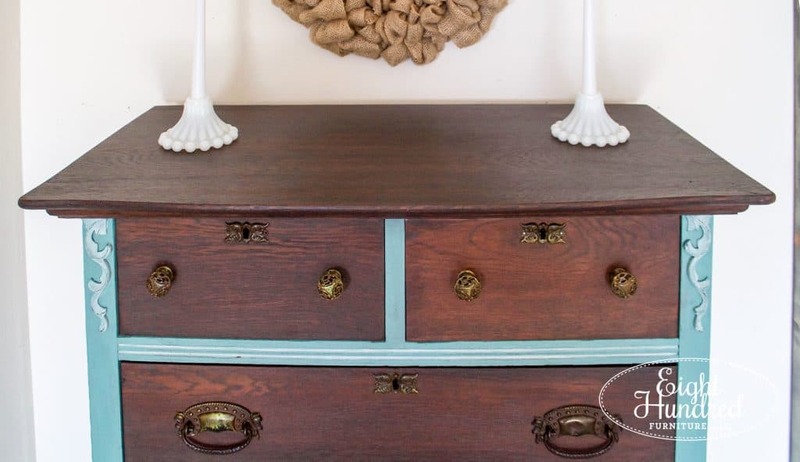 Now that may annoy potential buyers, but the way I see it, the dresser isn’t brand new. It’s kind of outside my skill set to build a new runner for a dresser drawer, so this one is just going to have a few quirks. 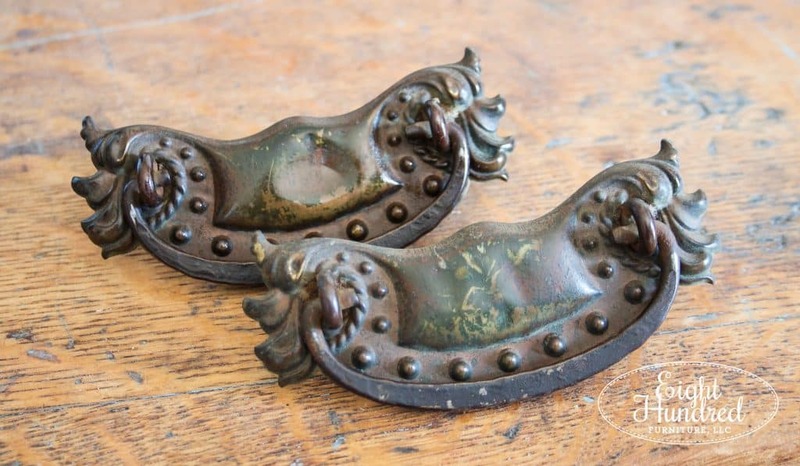 A true antique lover won’t mind it so much. 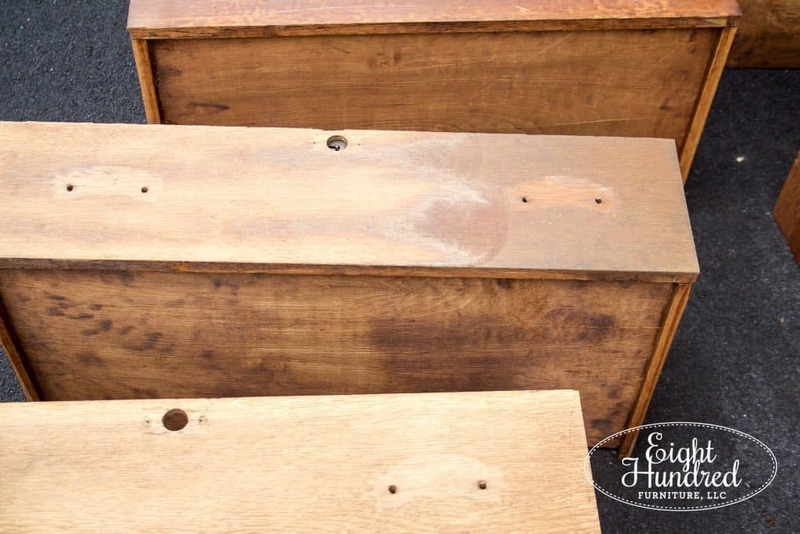 Once the drawers were reconstructed, I stained the top of the dresser and all the drawer fronts with General Finishes Java Gel. Guys, this product is my absolute favorite to use whenever I refinish wood pieces. First, it’s a gel stain, so it has the consistency of chocolate pudding. It’s thicker than traditional stains that come in liquid form and it doesn’t spill or run easily. Second, it doesn’t have a strong odor. For someone like me who works indoors 80% of the time, using products that don’t have any odors is critical. 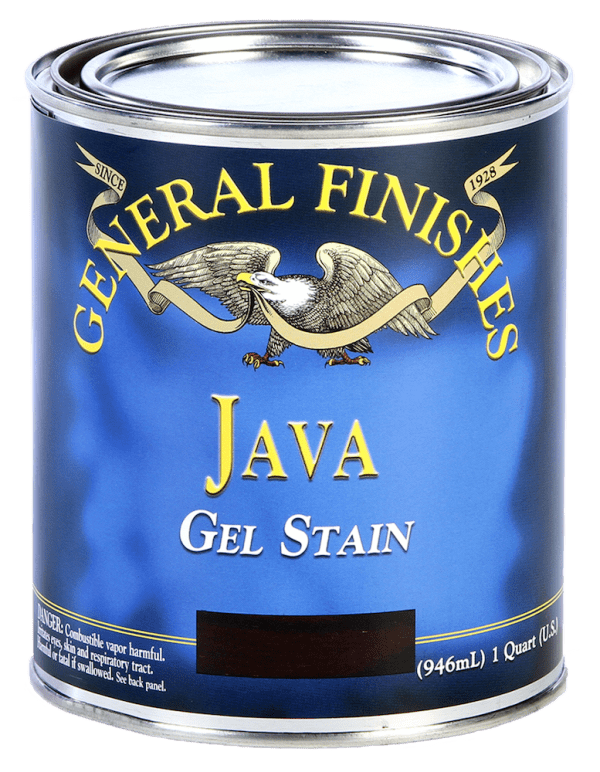 Finally, the stain itself is such a rich and deep java color, that it looks absolutely stunning on everything it’s applied to. It covers and hides scratches and dings and I love how every species of wood takes the stain differently. Oak has a very pronounced grain to it (which I adore), and it was perfectly highlighted by using Java Gel. Unfortunately, I don’t have any photos of the staining process because my hands were covered in…well…stain, so I could’t work my camera and stain at the same time. Just trust me, it was pretty. 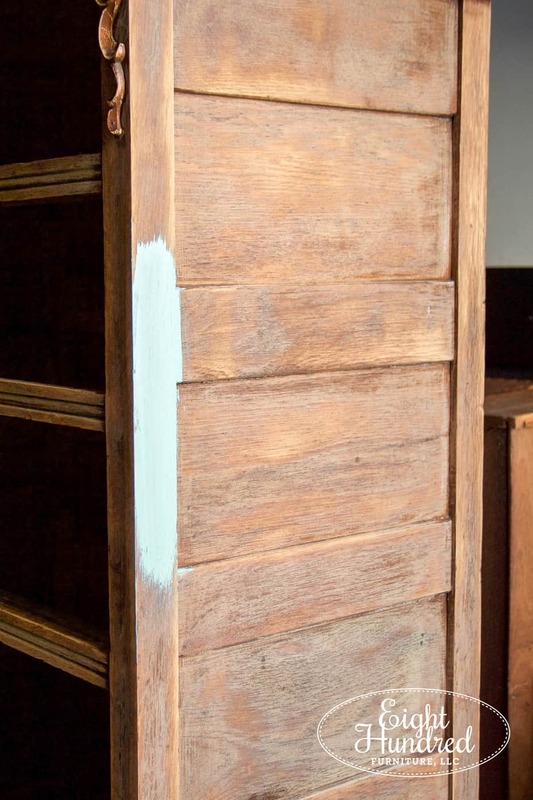 I sealed the stain with General Finishes Water-Based Topcoat, Flat Out Flat. This literally has NO SHINE whatsoever, which was perfect for this piece. 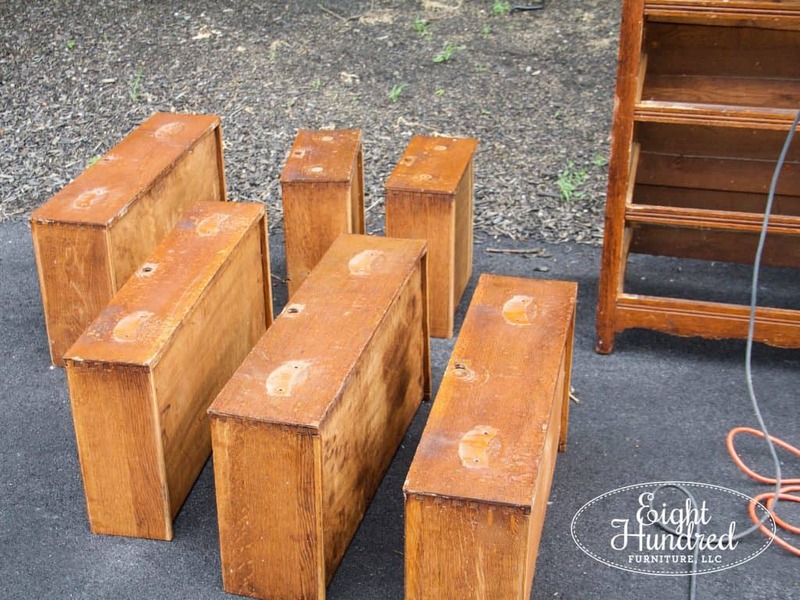 I wanted the look of beautifully stained wood without a glossy shine. 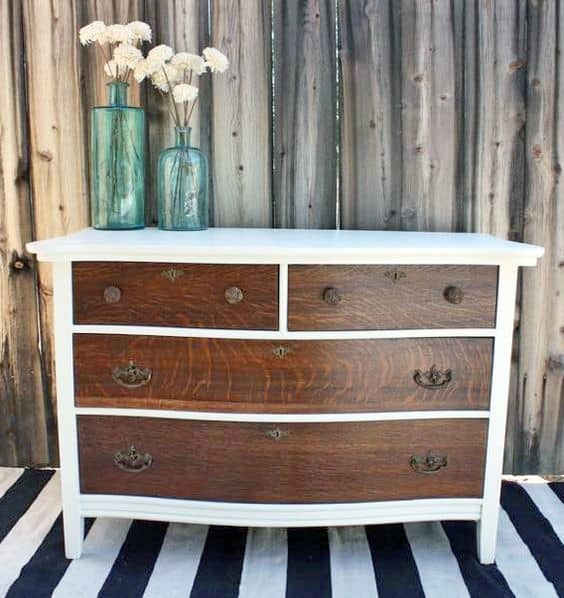 My next step was to paint the body (because I always stain my tops before I paint the body of furniture). I went back and forth quite a bit on the color I wanted. I couldn’t decide on a look. Should I go with black? Or maybe a warm gray? Or should I go for a classic white? Eulalie’s Sky is a pale aqua named after the color of the sky in a cow painting by Cindy Austin. Marian (aka Miss Mustard Seed) has had the painting of this cow, named Eulalie, in her home for years. 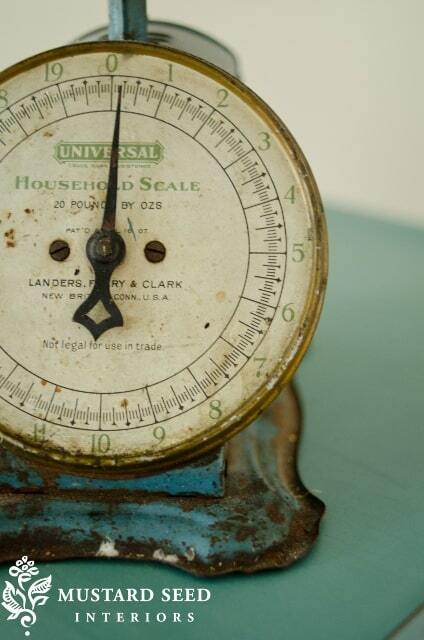 Kitchen Scale is more of a dreamy teal that was named for a scale that Marian had in her home. 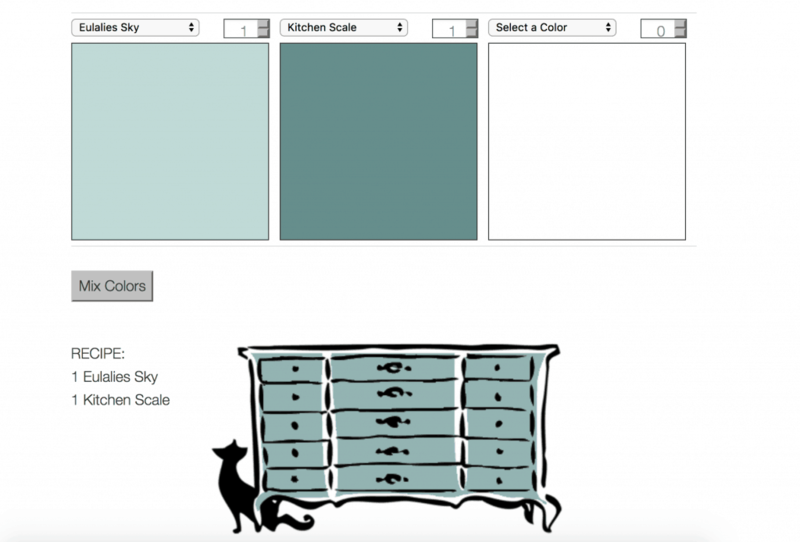 Mixing these two beautiful shades together gave me the prettiest bespoke color! I was in love after the first brush stroke. 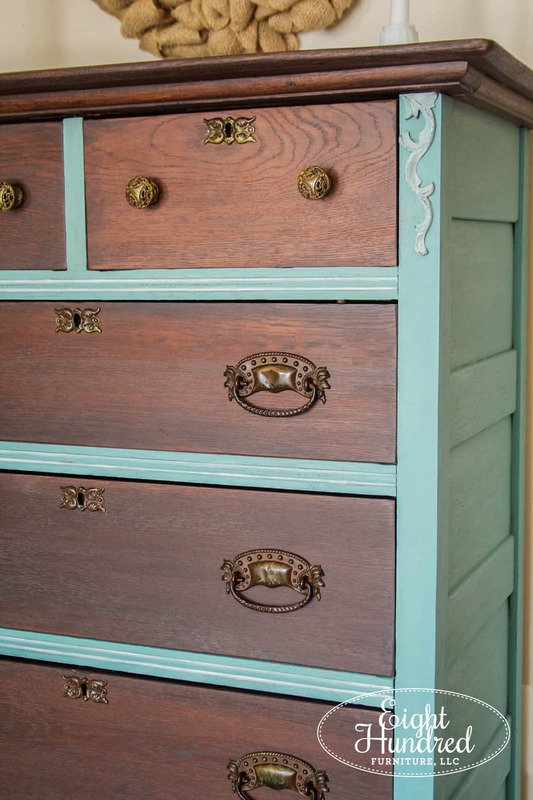 That beautiful greenish-blue-aqua color paired ridiculously well with the dark java-stained drawers and top. 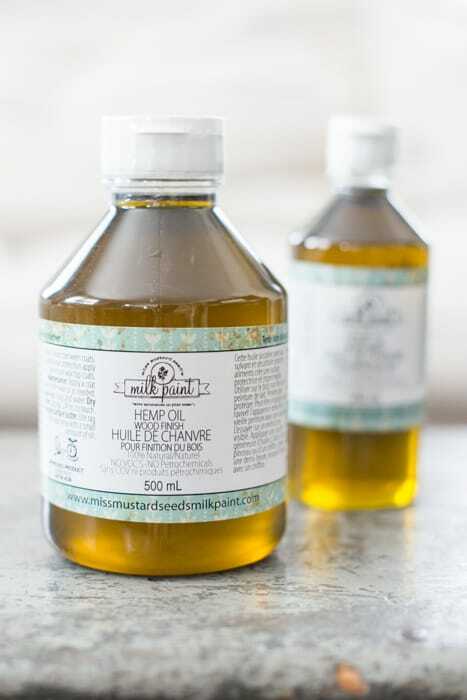 A hydrating coat of Miss Mustard Seed’s Hemp Oil brought out the color even more and made it richer and deeper. I used 400 grit sandpaper to wet sand the body of the dresser for a super smooth finish. 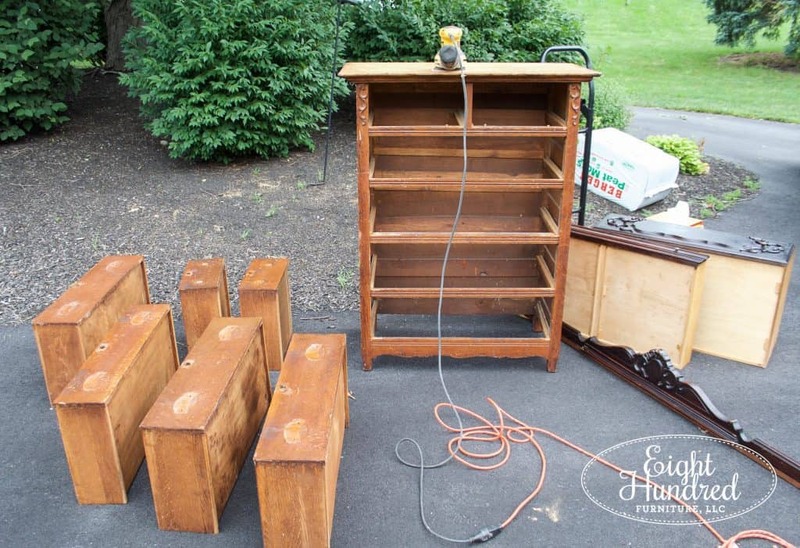 Wet sanding is a technique that you can do even if you’re a novice MMS Milk Paint user! 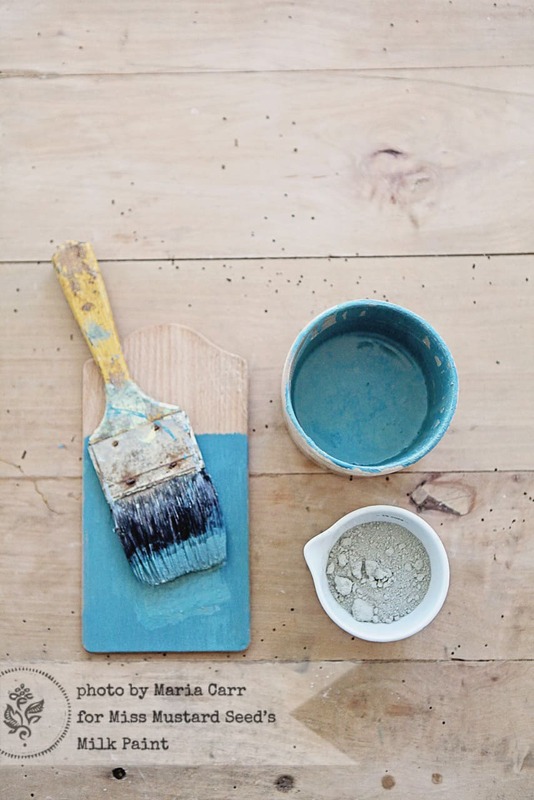 You apply Hemp Oil to your surface and use a very fine grit sandpaper (such as 400 or 220) and you sand your surface while it’s wet…hence wet sanding. Wipe your surface back with a clean cloth and it will feel like “buttah” when you’re done…trust me! 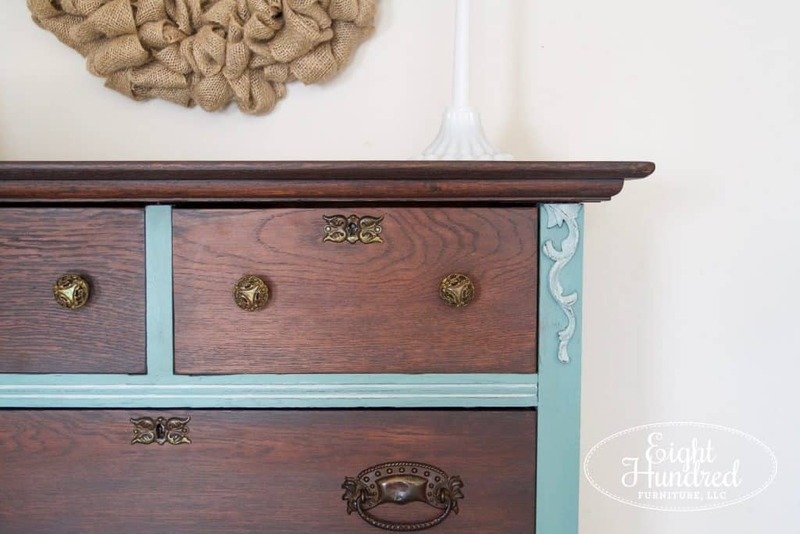 I took some Farmhouse White and highlighted some of the carved details along the drawer supports and painted the scroll work in each corner to make them pop. It also helps to break up the monotony and add some interest all over the piece so your eye continues to wander. My last step was to rub Hemp Oil over all of the original hardware to shine it up. In the photo below, the handle in the back has Hemp Oil on it and the front does not. After everything was put together and lightly staged, I shook my head in disbelief that I had actually pulled this dresser off the curb and saved it from the trash. I mean, c’mon! Does this look like a trash pick to you? I’m seriously crazy about how this turned out. 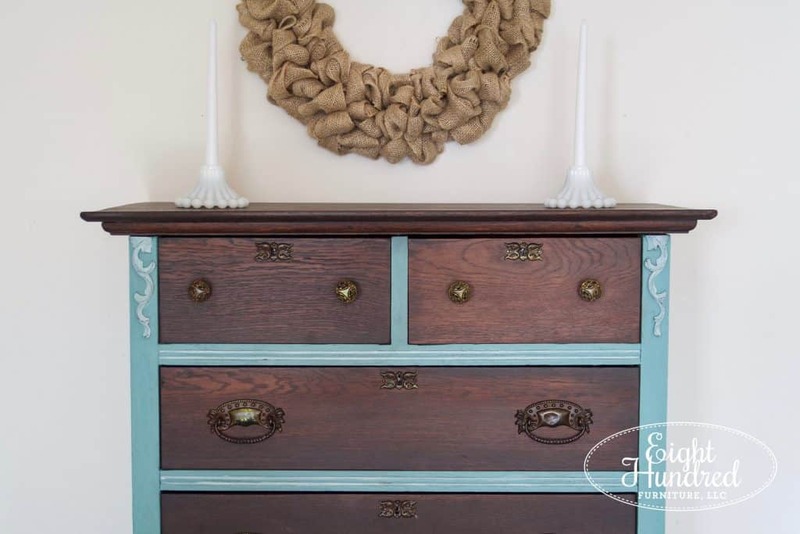 I know every furniture blogger says that about a really pretty piece, but I really do love everything about this dresser despite its disheveled state when I found it. 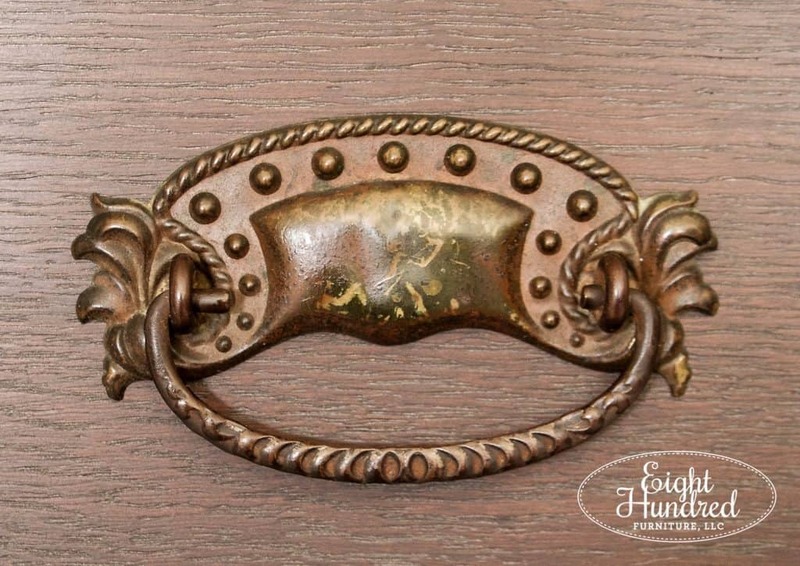 The knobs and the key hole covers are so charming! The top stained up so perfectly. I wish you could run your hand over it through the computer. I brought it up to 220 grit so it feels super soft! The little flourishes are just the sweetest touch! So let’s revisit this piece before, shall we? This piece will be for sale at Painted Table Designs. I’ll be trucking it over in The Marshmallow tomorrow afternoon, so if you’re interested, swing by and give it a visit. 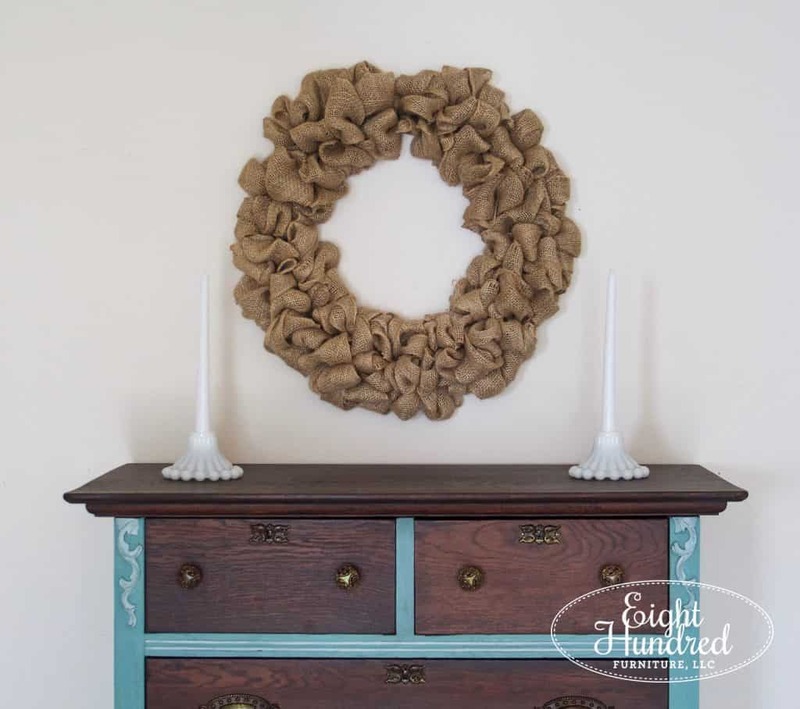 If you would like to replicate this look on a piece you have, here’s a list of the materials I used. 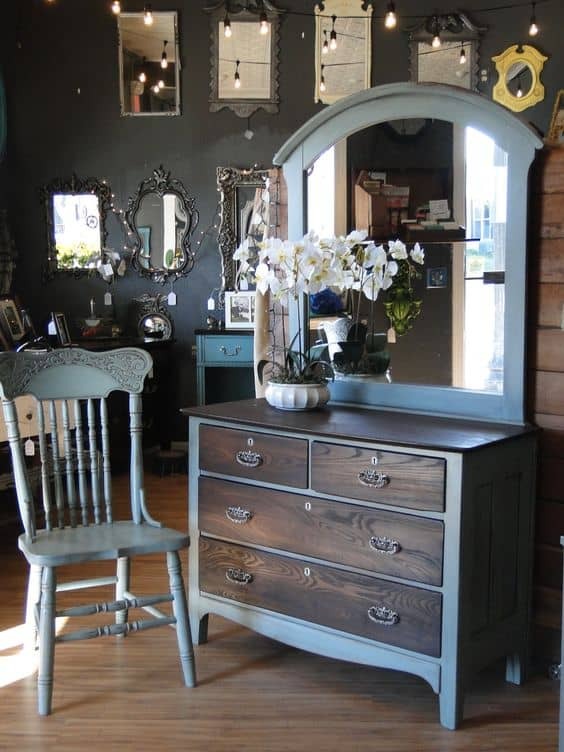 You can shop for all of the Miss Mustard Seed’s Milk Paint products I used at Painted Table Designs or in my booth downstairs at Morgantown Market.